A specialist unit (part of the Engineers). Tunnelling companies dug subways, cable trenches and dugouts. Their most important work was burrowing under enemy trenches to plant explosives. From late 1915 the British forces began planning large-scale tunnelling operations and developed sophisticated listening techniques to detect the presence of enemy tunnellers nearby. The New Zealand Tunnelling Company formed in October 1915 was made up mainly of experienced miners. It worked exclusively on the Western Front from March 1916 until the end of the war, serving separately from the rest of the New Zealand Division. It conducted mine warfare in 1916 before switching to preparing underground caverns around Arras. The Tunnelling Company worked on underground accommodation and bunkers in the Arras area until July 1918, when it became engaged in engineering work such as bridge building during the Advance to Victory. Cap badge: The initials ‘NZE’ (New Zealand Engineers) in a circle bearing the motto Quo fas et gloria ducunt (Where right and glory lead) and surmounted by a crown and lion. Collar badge: small grenade. The New Zealand Tunnelling Company wore the New Zealand Engineers’ shoulder title. Puggaree (hatband) worn by the New Zealand Tunnelling Company as a sub-unit of the New Zealand Engineers. Recruited in New Zealand in 1915, the men of the Tunnelling Company arrived in France in March 1916 under the command of 33-year-old regular soldier and Boer War veteran Major J.E. Duigan. The first New Zealanders to reach the Western Front, they were a so-called non-divisional unit – not part of the New Zealand Division, which arrived from Egypt the following month. Most of the tunnellers were quarrymen, gold miners from Waihi and Karangahake, or labourers from the Railways and Public Works departments. Others were coal miners from the West Coast of the South Island, but these workers were generally discouraged from enlisting due to the essential nature of their industry. The hardbitten tunnellers gave Duigan some disciplinary headaches. He later grumbled that he had ‘17 ex-secretaries of Labour Unions in the Unit’, as well as members of the ‘Red’ Federation of Labour. But with both the Allies and the Germans trying to tunnel under each other’s lines to lay mines, their underground experience was invaluable. At first, they were involved in successful efforts to foil German mining – known as counter-mining operations – just to the north-east of Arras. In November 1916 the tunnellers moved to Arras itself. Over the next five months they worked at connecting and extending the two existing underground systems and creating new tunnels. They helped construct a complex system of galleries, subways, kitchens, headquarters and hospitals – facilities capable of comfortably housing at least 12,000 men at any one time. To assist orientation, the locations in one of the systems were all given New Zealand place names, from Bluff at one extremity to Russell at the other (another tunnel system had British place names). Godley Avenue, named after the New Zealand Expeditionary Force commander, Sir Alexander Godley, linked the locations. The New Zealanders also left graffiti on the walls, including a large ‘Kia Ora’ flanked by ferns. The men of the Tunnelling Company were not the only New Zealand troops involved in this work. For two months a 43-strong party from the New Zealand Pioneer Battalion assisted them. Infantrymen from the New Zealand Division also helped out, along with British troops. With a major Allied push planned for April 1917, the tunnellers shifted to a more offensive role early in the year. They tunnelled towards the enemy lines from inside the cavern system and laid three mines under German trenches for detonation when the attack began. Tunnels were also driven to positions just short of the German trenches to assist communication as the attack developed. However, some of these efforts were negated by the February pull back of Germans in part of the sector, following the sudden abandonment by the Germans of the Somme battlefield and withdrawal to the Hindenburg Line. During the advance of 9 April the cavern system proved briefly useful in one small part of the attack front. One of the fourteen BEF divisions involved was able to pass through it to emerge in no man’s land near the enemy line. But the rapid advance of up to 5 kms along the whole front soon left the system well in the rear. The Germans eventually brought the advance to a halt, though not before the Canadian Corps seized the tactically important Vimy Ridge. As with most Western Front battles, this victory was achieved at a great cost in lives, with more than 3500 Canadians being killed and a further 7000 wounded. Following the April 1917 offensive, the tunnellers were deployed on a number of tasks in the vicinity of Arras. During the winter of 1917–18 they returned to the cavern system to refurbish it for possible use when the Germans launched their anticipated spring offensive. 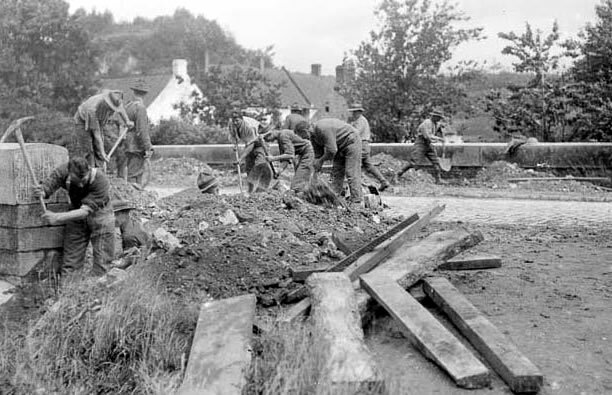 During Operation Mars, on 28 March 1918, the tunnellers occupied a reserve trench to bolster the defences, but in the event were not needed as the main defences held firm. The Tunnelling Company finally left the Arras area in July 1918. During the Hundred Days Offensive the tunnellers built bridges in the same sector in which the New Zealand Division was serving. By the end of the war they had suffered at least 62 deaths and many more non-fatal casualties in the course of their overseas service. The tunnels were closed after the Second World War and not rediscovered until 1990.